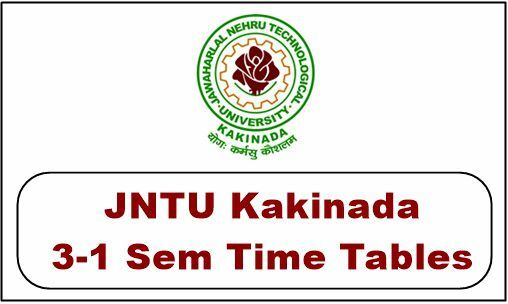 JNTUK 3-1 SEM Time table 2018: JNTU Kakinada 3-1 Regular & Supply Time tables October/November 2018 for R16,R13, R10 B.Tech Exams, jntuk III year I sem end examination time tables 2018. Jawaharlal Nehru Technological University, Kakinada (JNTUK) has announced the B.Tech/B.Pharmacy III year I Semester R16,R13, R10 Regular/ Supplementary Examination Time Tables October 2018 on it’s official site. The Candidates who are looking for the 3-1 sem time table, All those candidates are requested to download the 3-1 sem Time Table 2018 from below. After that, the students are advised to start preparing for the semester examinations. Everyone is keenly observing for the 3-1 semester time tables subject wise along with jumbling centers list. Now we have given date sheets separately for all regulations r16, r13, r10. So students must download same from below given directed links. jntu kakinada university is a popular in andhra pradesh which gives quality education through the year among other. lakhs of students will come out every year from affiliated colleges successfully. The JNTUK Time tables contains branch wise (Civil, ECE, CSE, Mechanical, EEE, IT, AE, PE) examination dates and time. You can also get the regular and supplementary examination Jumbling Centres from here. As per the schedule, the examination will be held from October 27th, 2018. The candidates who are searching for JNTUK 3-1 sem Time Table 2018 you will need to visit the Official website: jntuk.edu.in or click on the above links. When we conduct the external lab exams in college? ?